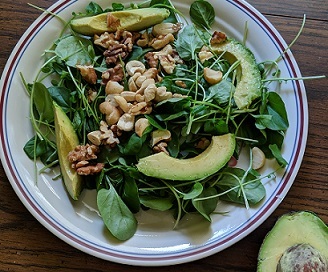 Watercress is a green that can be used in salads, sandwiches, soup, and anywhere else where you might use arugula, spinach, and other greens. 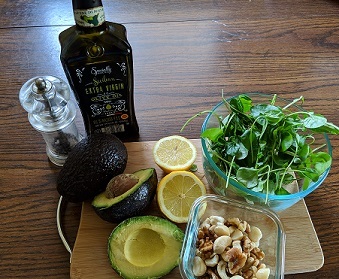 I just recently heard what a nutritional powerhouse watercress is so thought I’d give it a try. I found it at a local grocery store in a plastic tub similar to what the other greens I buy come in. The watercress that I bought was grown locally. Given that I bought it in March, it must be grown hydroponically or in a green house. There are no greens growing in fields in northeast Ohio this March.The cost was comparable to buying baby kale, spinach, and spring mix. I liked the flavor of watercress. It’s has a bit of a bite to it, though not as strong as arugula. It’s good. It stands up against other flavors without being overwhelming. As you can see in the photo, watercress has long stems on it. Recipes all said to remove stems, at least the thick ones. That is a long, slow chore so I sort of skipped it. According to the USDA food composition datatbase, watercress is very low in calories. Actually, it’s very low in fat, protein, and carbohydrates so you can eat a lot of watercress. It has a lot of vitamins and minerals, including potassium, Vitamin A, Vitamin K, and calcium. 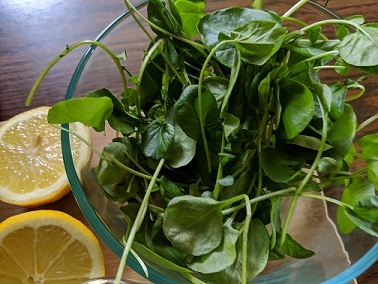 Here’s a salad to make with watercress. Salad Dressing: Mix lemon juice and minced onion. Whisk in olive oil and season the dressing with salt and pepper. Spread mixed nuts on a baking sheet and bake in oven for about 5 to 7 minutes. The nuts should be golden brown and fragrant. Watch them carefully so they don’t burn. Let the nuts cool and then chop them coarsely. In a good-sized salad bowl, toss the watercress, nuts, and salad dressing until coated. Add the avocado wedges. Serve immediately. Note: You can use one type of nut. 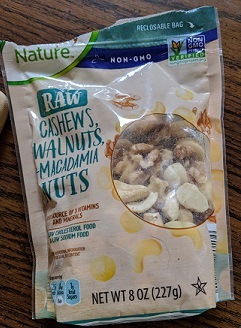 I had the raw mixed nuts that contained walnuts, cashes, and macadamia nuts so used that.